Check out the LPOC’s website here. Click here to visit their Facebook page. 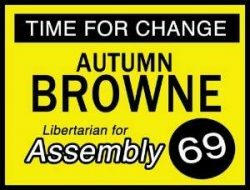 Click here to read the complete Libertarian Party platform. Well, Art, did you happen to notice the entry on the LPOC website for the meeting is preceded by info on the 2009 OC Fair? I don’t know if I am interested in donating or joining online. Who is running the show here in Irange County? You can check out their members on Facebook, at this link: http://www.facebook.com/groups/359883101474/. I believe that Tom Hanson is the current North County LPOC Chairman. His email is tom121872@yahoo.com. I am not sure who is the South County Chair. Thanks. And, thanks for the link on your blogroll. We’ve reciprocated. We’re also on meetup.com com as well. Thanks Tom and thanks for the link! Tom, are you also running the LPOC Website? Jeff, there are various categories one can post on, on the lpoc.org site. Yes we should be more consistent on how we post on the site. We would appreciate your feedback to help us improve the site, additionally when Art comes to our events I hope he will allow me to pick his brain on how to make the site more effective. I hope to see you Tom at the upcoming meeting. Will definitely be happy to help! Hi, great article. We are huge members of the Liberty movement here too – so much that we built the green-blue bracelet in Atlas Shrugged. It’s called the Liberty Bracelet and you can check it out at http://www.libertybracelet.com. Proceeds are going to the Presidential Campaign for Ron Paul so we thought you might be interested. If you’re interesting in posting an entry about it or have us write an entry on your site, we’d love to have you join our affiliate program for you to get commissions from each Liberty Bracelet you help sell and put that towards your site or your local political party! We’ll even help out with a posting! Anyway… cool blog… we joined your feed now so we’ll be checking in regularly! Did somebody say drinking? I’m in! So did say Progressive Liberal Vern Nelson editor of the OJB and landed with 4 DUIs. What happened to three strikes law? Can anybody say, comment moderation? Have you seen the unhinged anon comments at the OJ and the Lib OC? At least Fiala doesn’t resort to sock puppetry. You may not agree with him but he is correct. Stanley is correct in stating that the editor of the OJ has 4 DUI’s. Who the hell goes to prison for a DUI??? OK, guys, I was just kidding. I am never in favor of censorship and was just jerking Stanley’s chain. We need to lighten up around here once in awhile. Anyone who injures property or the person and usually for a long, long time. We had a nice meeting tonight – about twenty in attendance. No, we did not talk about you Vern. But we did talk about the Regulate Marijuana like Wine measure and our upcoming So Cal Libertarian Conference. (See my latest post). Well, good for you guys. Occupy is getting behind that measure, along with the Millionaires’ Tax, and the Corporate Political Accountability Act. Nice to have a little overlap of interests there. Maybe we’ll get this thing done finally. If you follow my comments Gröfaz, you will see that I am in support of the occupy movement and have actually made an offer to the Santa Ana City Council to purchase its rights to it’s camping in Santa Ana of which the written copy is published in New Santa Ana. As a political science scholar, I do recognize all elements of a revolution among which a lumpenproletariat aka OCCUPY plays a key role. That is why many groups even the TEA PARTY will form a coalition with the OCCUPY. However, never in the history did lumpenproletariat enjoyed the fruits of its revolutionary suffering. Every revolution starts with lumpenproletariat taking it to the streets and ends when the lumpenproletariat is lucked up in gulags aka concentration camps. Currently there are the accommodations build in the California’s high desert to house about 2M of occupy members. See FEMA. Hey there Stanley! Miss you lots. How do the agendas of Occupy and Tea Party fit into the the theories of ” the realm of magic” and “the cycle of life”? I hope that you will contribute regularly to this free spirit OC Politics forum. Your question is interesting one, Fawkes! In this instance they are both doing “rope jumping” as they do the “hula hoop to da loop” trying to enter “the cycle of life” in the darkness, never reaching ” the realm of magic”. The realm of magic is reachable only in the free spirit of an individual not in the chaos of the lumpenproletariat’s masses.